Obviously your smartphone value will decrease time to time. Even after the day you bought it, around 1/4 of its price will be decreased. Now let me ask you one simple question. Why people sell their phone? In most common cases, either it's too old or defected piece. This is the reason why people used to buy new phone instead of buying second hand. Well if you're planning to buy a new phone and want to sell your old one in good resale value, you've to keep it in good condition. 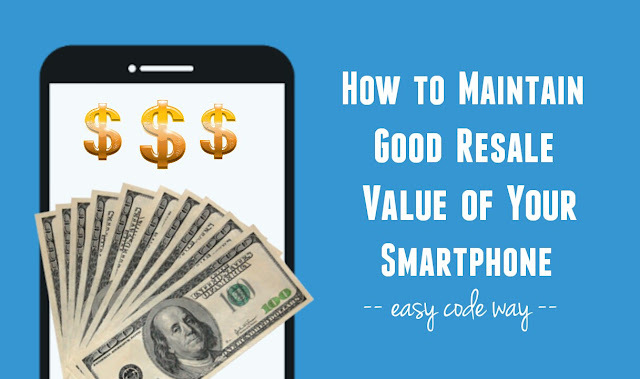 These simple tips can help you maintain your smartphone so as to fetch maximum resale value from it. The first thing people demand while buying a second hand phone is good screen without any crack in it. You should keep it scratch free. Use original screen guard to protect it (they will cost you few dollars only). It's good to replace your old screen guard at the time of selling your phone. It will look more new and healthy, thus you can ask for good resale price. Some people use cheap lamination which is not good for touch screen mobile. It degrades the smoothness of screen. Now a days, many also people use tempered glass to protect their phone screen from unnecessary crack and scratches. Although it's a great protection but tempered glass add towards the weight of phone and this is the reason why I don't use them. Imagine yourself as a buyer. Would you like to buy a phone which isn't good by its physical appearance? No. Phone cover is another important thing to protect it from external damage. Go to your nearest phone store and buy 2-3 covers of different designs. Again this will cost you few dollars only and you can even buy them from your monthly pocket money. Regularly change them time to time and it looks like you're using a different phone. Another important thing is that, you should buy those phone covers only which have long and thick edges. This will protect your phone screen from unnecessary crack and scratches. No doubt, people ask for battery backup while buying a second hand phone. The more fast battery will drain, less will be its resale price. You should take good care of your phone battery. Always charge it with original charger and don't overcharge. In my previous article, I had already discussed on how to improve smartphones battery life. Those simple tips really works. Also make sure to keep your battery fully charged when you're showing your phone to the customer. Many people complain that their phone hangs after a long use. This is what happens with most of the Samsung users. Well it's not the manufacturer fault. It all depends on your phone RAM memory. The more RAM space will be, the more fast and smooth your phone will work. On the other hand, malware also slow down the phone speed. They eat unneccasary space and even work in background when you're not using your phone. To solve this issue, you should regular scan your SD card and internal memory to remove viruses from it. Don't install apps from unknown sources or unofficial third-party apps. As of now, you can delete cached data to free up some RAM space. To do this, go to "Settings > Storage". Now click "Cached data" option followed by OK button. If you want to fetch maximum money from your old phone, you've to sell it along with its original charger and earphones. Give them as a part of gift package. These little things really add up and they can increase your phone price by 1500RS least. You should maintain your charger and earphones in good condition. Here are few more essential tips to maintain your smartphone condition in order to get maximum profit from it. Don't keep your smartphone in hot place and when it get overheated, immediately put it in cool place (like under the AC or cooler). Don't sink it in water - Before going to take bath or swim, make sure to check your pockets. Once your phone will absorb water, some of its function will start misbehaving and thus no one will buy it in reasonable price. Hold your smartphone well and don't let it fall accidently. Take good care of it while giving it to the children. By following these simple tips, you can easily maintain your smartphone to fetch maximum profit from it. If you know any other better way, please share it in the comments. Which phone you are going to sell and in which range?